BS5852 ( source 1, 2, 3 and 5 ), BS5867 for United Kingdom. FR M1 NFP92-503-505 for France. Our Fabrics are lightly with waterproof, Oekotex standard 1oo certificate which is transport easily and kind for environmental protection. It is a cheap and good material for air duct system. Fabric Duct and Diffuser Systems have many advantages and benefits, many of which are green and can be helpful in attaining LEED credits. Simplified Design/Uniform Air Dispersion: This means less ductwork! Because the entire Air Duct System is a diffuser, air can be supplied to the occupied space in a more efficient pattern. 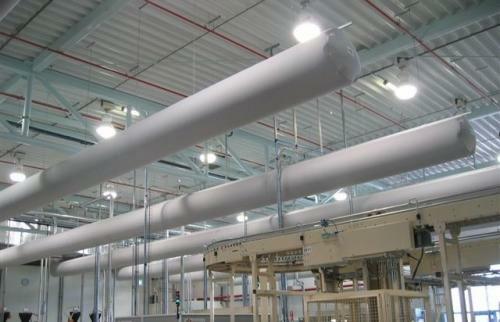 Air Duct Systems may be designed with fittings similar to metal ductwork, including many standard zippered fittings and unlimited customization to match any application requirements. Cost Savings/Minimal Labor Hours: The cost of a Air Duct System is 20 to 80% less than metal. The cost savings of air porous Air Duct are even more dramatic when compared to insulated/double-wall spiral metal duct or premium materials. There is also considerable savings in the labor time required to install Air Duct versus a comparable metal system. It may require 10 times more labor (man hours) to install metal and the savings increase with diameter. Lightweight/Easy to Ship: The weight of a Air Duct System can be significantly less than a comparable metal system. Designing with Air Duct Systems means lighter roof loads, ease of handling, and reduced need for power lifting equipment. Air Duct can be packaged and shipped to your location from any of our manufacturing facilities. Smaller and lighter packages reduce transportation costs and damage. Quiet: With a properly designed Air Duct System, air is delivered quietly and without the resonating properties found in metal. Additionally, Air Duct fabrics provide noise absorption benefits in the occupied space. Air Porous: Air passing through the fabric may eliminate the risk of condensation and deflect airborne dust from accumulating on Air Duct surfaces. Hygienic: Some of our fabrics feature an active antimicrobial agent that inhibits bacteria growth. Easy to Maintain/Clean: Cleaning metal ductwork can be expensive—these costs are often overlooked. A dirty duct (interior) can be a leading contributor to sick building syndrome and human health problems. When it comes time to clean your Air Duct System, it can be easily removed and laundered. The cleaning process can involve either vacuum cleaning and/or hand or machine washing depending on the fabric. Air Duct Systems are designed with zippered sections for ease of handling and are sized to fit into industrial washing machines. Ease of Use: Lightweight, simple, and easy installation/removal.Ease of Use: Lightweight, simple, and easy installation/removal. Forgiving: Air Duct fabrics will not dent or scratch like metal ductwork. Colorful/Personalization: Our fabrics are available in a variety of standard colors and patterns, including custom colors to match any interior decor. Air Duct can personalize your Air Duct System—advertise your company or school logos, mascots, inspirational sayings, sponsors, or suppliers. GREEN Advantages: In addition to having recycled options for some of our fabrics. Where to use air duct system? Air duct system is widely used in public places such as the University, laboratory, Food workshop, warehouse, Telecom room, air port, hospital, Pharmaceutical factory, swimming pool, etc. We are fabric manufacturers, control each process during fabric making. It will control the quality well, save the cost and time directly.